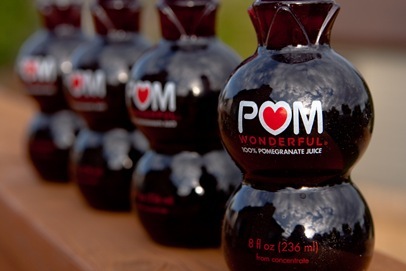 A representative from POM Wonderful contacted me last week to see if I would be interested in trying their juice. Heck.Yes. 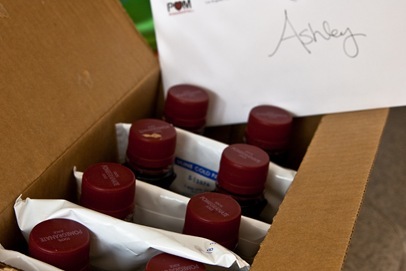 Eight chubby bottles of their pomegranate juice arrived at the door yesterday. I also received a fun package of goodies from Stonyfield. 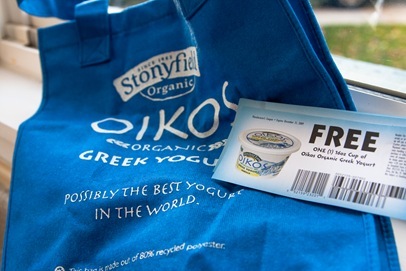 I got coupons for their Oikos Organic Greek Yogurt, which I am in love with. I also got a super cute shopping bag made out of 80% recycled materials. Thanks Stonyfield! Visit this link to get some coupons of your own! I wanted to give you guys a recap of the cost of our meals this week. I was pretty excited about the final numbers! It is kind of hard to know how to figure out the total cost though. Do I include things I already have in my pantry? If I only use half a bag of rice, do I only account for 1/2 the cost in the total? If I buy a bag of rice [for example] specifically for a meal, I will include the full price of the rice, even if I don’t use it all. When I use the rest of the rice, for another recipe, this will now be included in my pantry list. It is too hard to figure out percentages of what I’ve used, so I figure I’ll include the full price the first time I use the item. I will divide the total grocery cost, for that recipe, by the total number of servings we got out of it. If it is a big enough serving for 1 adult meal, I am counting it as 1 serving. How much would it cost to feed a family of 4 at McDonalds? These meals are also sliiiightly [understatement] healthier than anything you will find under the golden arches. So, I was planning on making the red beans and rice tonight, but guess what I forgot to do?? Soak the beans overnight. FAIL! I was so mad when I realized this. But, it was already pretty late and the meal would have taken 2.5hrs to make anyway, so we’ll save it for another night. I l.o.v.e. french toast!! This was on a whim and turned out really good. Super easy in a pinch! 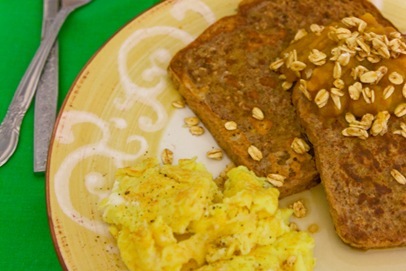 All of these things were pantry items – SCORE! Heat skillet on med. and grease with a little butter or oil. 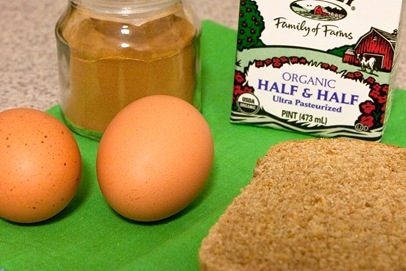 Dunk both sides of each piece of bread in egg wash to cover completely. 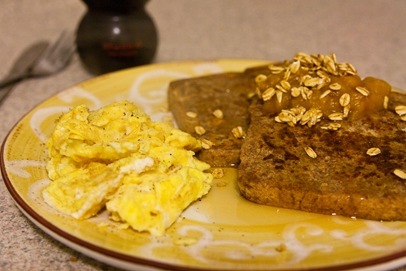 I topped it with warm pumpkin puree, a little maple syrup, and 1T of vanilla granola. I also scrambled 2 eggs on the side! It was sooo good with the glob of pumpkin on top! I have never done that before…but will definitely be doing it again =) Had some POM juice to wash it all down. I’m headed to Cleveland this Saturday, to visit my family. I grew up [well, the first 7yrs of my life were in Michigan] in an eastern suburb of Cleveland. I moved to Columbus, OH for undergrad and lived there for 5yrs and then moved to Charlotte, NC for grad school and lived there for 3yrs. I’m going for a week and super excited to visit friends + fam and hang out with my bro for his 30th birthday!!! [which was today] I’m taking Chris’s camera [yay!!] and will be keeping the blog updated with fun food stuff. I am planning on making caramel apples with my cousins and lots of other yummy things! p.s. It snowed today…ICK! You can barely see it in this photo but later in the evening it was starting to accumulate. Not ready for it! off to cleveland…for better weather!